The new market study on military UAVs by Market Forecast indicates a growth of the Military VTOL UAV market from 81 million in 2016 to 392.8 million in 2022, so over 400%. UAVs operated in Afghanistan and Iraq have demonstrated their usefulness in Counter-Improvised Explosive Device (C-IED) tasks. Vertical Take-Off and Landing UAVs (VTOL UAVs) are particularly seen as suitable for C-IED with the air vehicle capable of hovering at a distance to find and locate Improvised Explosive Devices (IEDs). 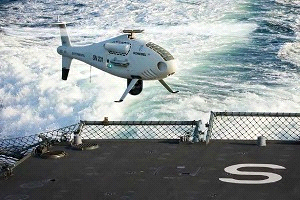 VTOL UAVs are additionally seen as useful in urban environments, for maritime ISR tasks from naval vessels and in areas where normal fixed-wing UAV operations might be difficult due to terrain, threats or insufficient support personnel deployed at forward bases to recover the UAV. Major companies offering VTOL UAVS include Northrop Grumman with the MQ-8B/C Fire Scout, Austria’s Schiebel with the Camcopter S-100 and UMS Skeldar, a joint venture formed between Sweden’s Saab (47 per cent) and Switzerland’s UMS Aero Group (53 per cent), with the Skeldar series. Multiple countries have bought or intend to buy VTOL UAVs like: USMC (USA), ONR (USA), Bulgaria, Germany, Greece, United Kingdom, Portugal, Norway, Korea, The Philippines and the UAE. For everybody involved in the military VTOL UAV market and the Military UAV market in general the new market study gives deep insight in the future of military UAVs globally.